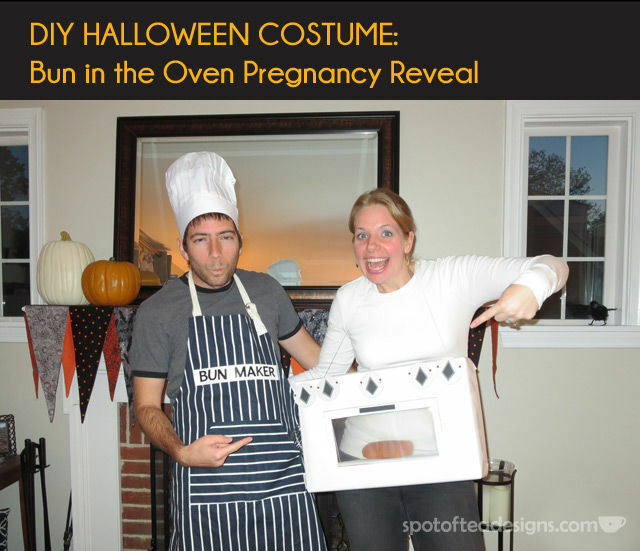 The oven: I initially expected to put myself in a big box again for this costume, but I learned my lesson from my pacman costume last year, and decided to find a smaller and more manageable option. For the oven I recycled the top of box that ships a ream of paper. 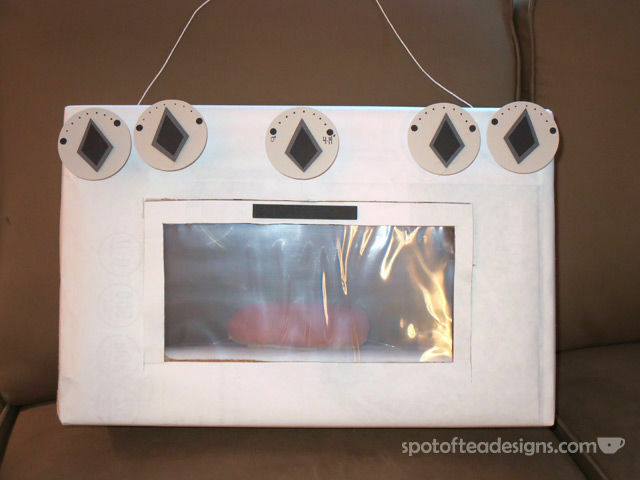 I used a hole punch on the top and bottom of the left and right sides of the oven to run string through so the oven could hang from me. 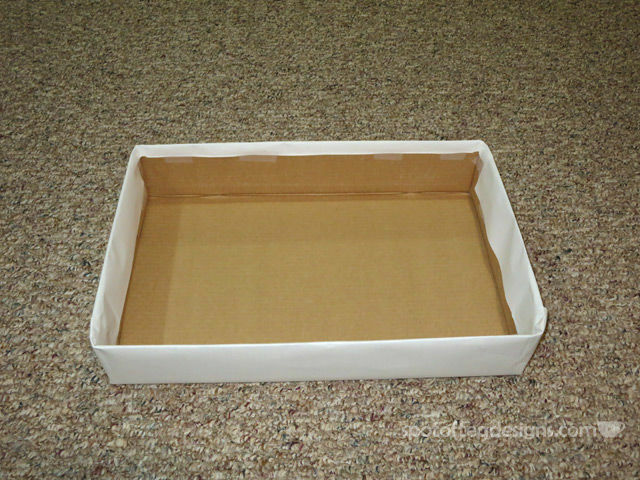 The box top had writing on it so I covered it up with recycled 11×17″ paper. 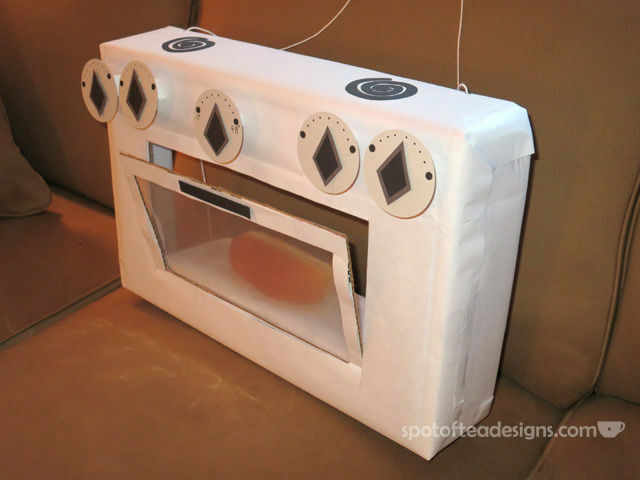 Tip: Use double sided tape to attach the wrapper to the large “front” of the box/front of the oven in a few spots (think about where your oven cut out will be and plan to tape around that). Later you will cut open the oven door and there’s nothing to hold the paper down so a little extra stick is helpful to add now, instead of trying to squeeze some tape in later. Use a straight edge to define where you will make the cuts for the door. I used an old scrapbooking page protector as the clear oven window. Tip: Consider making your pencil marks on the inside of the box so you don’t have to erase the lines after you cut! Leave enough space at the top of the box for the oven/stove top knobs. When cutting out the oven window, leave enough of an oven door edge to not compromise the strength of the box when you cut the outer edge and the window. Mine isn’t that big, but I wouldn’t really recommend going any thinner. Take your time when cutting, don’t rush it or you may pull the paper. Use a brand new blade to make the cuts. Doing this cuts through the box really nicely. If you don’t cut all the way through the first time, flip the box and the cut other side. I used a circle cutter to cut the 5 circles, a hole punch of black paper for the off/high marks and just a sharpie for the in between temperature lines. I used some 3D super large foam dots to get the knobs to stick out, but you could also use pieces of form core. The knobs themselves are double layered (the dark gray and black layers) to provide more depth. The bun: I wasn’t really sure what to do with this… I could stick something on my shirt to look like a bun or I had some stale hot dog buns and I could use one of those. I opted for the hot dog bun (cinnamon bun could work as well). 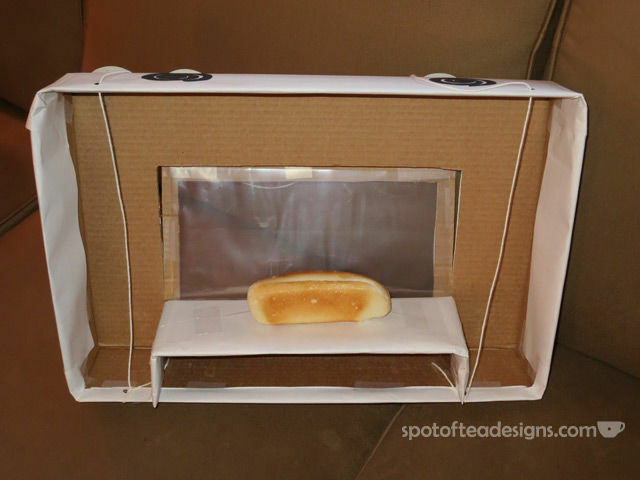 To be able to show off the bun through the window I constructed a little shelf out of cardboard inside in the oven. I added a layer of aluminum foil to the top of the shelf. I used a little double sided tape to hold the hot dog down and secured it further with some clear craft fishing line through the cut part of the bun and taped down on the side. It held up through the party. The result: Even though the party I attended doesn’t pick a favorite costume, we were definitely voted as having the best costume this year! It was really fun to walk through each room of the party and pause as each new group of guests took a second to digest the ‘bun in the oven’ concept. Some got it right away and squealed with delight, others would give a questioning “does that mean what I think it means?” look and others were a little slower. Overall it brought a lot of smiles to everyone’s face and our friends are still talking about it months later! Great costumes! Found you on the Posed Perfection link up!